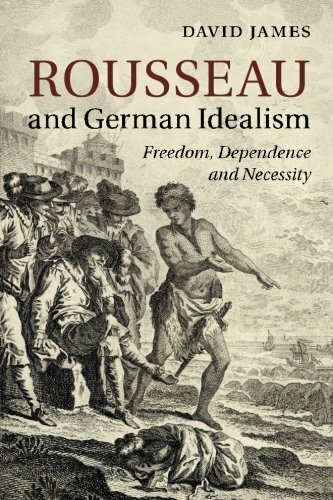 Amazon.com description: Product Description: The claim that Rousseau's writings influenced the development of Kant's critical philosophy, and German idealism, is not a new one. As correct as the claim may be, it does not amount to a systematic account of Rousseau's place within this philosophical tradition. It also suggests a progression whereby Rousseau's achievements are eventually eclipsed by those of Kant, Fichte and Hegel, especially with respect to the idea of freedom. In this book David James shows that Rousseau presents certain challenges that Kant and the idealists Fichte and Hegel could not fully meet, by making dependence and necessity, as well as freedom, his central concerns, and thereby raises the question of whether freedom in all its forms is genuinely possible in a condition of human interdependence marked by material inequality. His study will be valuable for all those studying Kant, German idealism and the history of eighteenth- and nineteenth-century ideas. About: The claim that Rousseau's writings influenced the development of Kant's critical philosophy, and German idealism, is not a new one.